We are one of the most trusted manufacturers and suppliers of Hot Plates and Magnetic Stirrers. Our services are dedicated to clients, thus we constantly aim to provide the best sort of service to our clients with dedication. To ensure best quality products to the client, our assortment is made following the set industry guidelines. 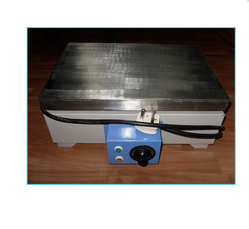 We offer Hot Plates (Rectangular Type) this is heavy duty heating plate with a removable MS plate at the top. The housing is made of mild steel sheet and finished in powder coated paint. A heat control switch for low, medium and high heat. 2 nos of indicating lamps are provided on the front panel. The rectangular hot plate a maximum power consumption of 3.5 KW. The unit is designed for operating on 220/230 volts, single phase, 50 Hz. AC mains.